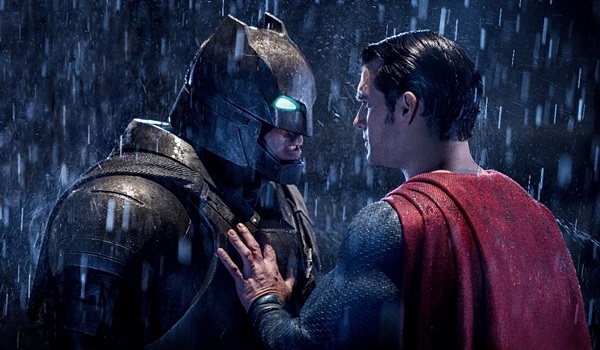 Batman v Superman saw a minor 34% dip on Monday and Tuesday to reach a $308.6 million overseas total by Wednesday. The results put the film past the $500 million mark globally with a $501.9 million cume. Top markets include China ($68.9M), UK ($28.9M), Mexico ($21.6M), Brazil ($14.5M), Australia ($13M), France ($10.8M), and Germany ($10.2M). Batman v Superman is up to $115.3 million overseas after bringing in $67.2 million over the past 24 hours thanks to the addition of 17 new markets. China registered WB's biggest opening day of all time in the market with a $20 million take (including sneaks). Flash numbers coming in for Saturday are suggesting a $22.6 million second-day gross, putting the film at around $43 million in its first 48 hours in the market. UK led new openers with $9 million from 1,700 screens while India enjoyed a $2.54 million bow from 1,372 screens. Other top openers include Japan ($1.2M, 718 screens) and Taiwan ($905k). Mexico continued to add to its tally with a $4.3 million take, raising its total to $9.6 million in its second day of release. Other top performers for Friday include Australia ($3M, $5.6M cume), Brazil ($3M, $6.6M cume), Germany ($2.4M, $5.1M cume), South Korea ($1.7M, $3.4M cume), Russia ($1.6M, $3.6M cume), Spain ($1.2M, $4.2M cume), France ($1.2M, $3.9M cume), Hong Kong ($1.2M, $2.4M cume), and Italy ($925k, $3M cume). Batman v Superman expanded to 38 additional markets on Thursday, grossing $33.1 million from approximately 19,700 screens to take its two day total to $44 million outside of North America. Latin America provided strong results out of the gate, with Mexico enjoying a debut of $5.8 million from 3,800 screens and Brazil impressing with a $3.5 million bow from 1,331 (including sneaks). Other top debuts came from Germany ($2.8M, 1,015 screens including sneaks), Australia ($2.5M, 594 screens), Russia ($1.9M, 2,000 screens), South Korea ($1.7M, 1,613 screens), and the United Arab Emirates ($1.1M, 112 screens). Holdovers included strong second-day tallies from Spain ($1.1M, $2.9M cume), Italy ($925k, $2M cume), and France ($953k, $2.7M cume). Batman v Superman took the top spot in all of its opening markets on Wednesdays, bringing $7 million from around 5,900 screens. Leading opening day tallies included Spain ($1.8M), France ($1.7M), and Italy ($1.1M). Saturday Update: Batman v Superman: Dawn of Justice launched to an estimated $82.01 million on Friday, including Thursday night's $27.7 million debut. That gives the WB/DC film the fourth highest opening day of all-time, ahead of Jurassic World's $81.95 million and just behind Avengers: Age of Ultron's $84.4 million. Yesterday's take also included $9.015 million from IMAX theaters alone. The aid of Good Friday crowds certainly played a role in the strength of opening day for the hugely anticipated superhero showdown, but unfortunately, word of mouth is proving to be a struggle so far following poor critical reviews. The studio reports a concerning "B" CinemaScore from audiences, while Flixster audiences have given it a 73 percent rating as of Saturday morning (comparing to 90 percent for Ultron through the same point). Still, BvS topped Furious 7's $67.4 million opening day to set a new Good Friday/Easter weekend record, and appears headed for a debut weekend around $168 million. Should that hold, it would be the second largest debut in Warner Bros. history behind Harry Potter and the Deathly Hallows Part 2 ($169.2 million) and the seventh highest overall; it would also top The Hunger Games' $152.5 million as the best March opening in history. Opening in third place yesterday was My Big Fat Greek Wedding 2 with an estimated $7.21 million. The sequel to one of the most popular rom-coms of the 2000s is successfully counter-programming against the superhero heavyweight as it looks to earn around $17.7 million this weekend (Universal itself is projecting higher at $19.06 million). Word of mouth, at 70 percent on Flixster, seems to be on par with last year's The Best Exotic Marigold Hotel 2 (69 percent). Meanwhile, Zootopia added $9.52 million on Good Friday, bringing its domestic take up to $226.93 million. That latest runaway smash hit from Disney Animation should score around $25 million this weekend as it continues to ride a wave of phenomenal word of mouth. Official weekend estimates from most studios will be reported on Easter Sunday, followed by all actual results on Monday. Friday Update: Warner Bros. reports this morning that Batman v Superman: Dawn of Justice landed with an excellent $27.7 million debut from Thursday's opening night beginning with 6pm shows in theaters across the country. That's an inch ahead of the $27.6 million posted on Thursday night by last year's Avengers: Age of Ultron, and also tops last year's Furious 7 ($15.8 million) for the new Easter weekend record. Notably, however, it did fall shy of The Dark Knight Rises' $30.6 million launch in July 2012 -- which didn't even open until 12am. Projections for the weekend remain on course for around $170-175 million. Good Friday today will surge attendance among those off work and school, while Easter Sunday could also benefit the film with some families heading to cineplexes. Ultimately, though, the big question mark remains how quickly (and how much) of an impact poor reviews and questionable word of mouth will have on the film's debut. Meanwhile, My Big Fat Greek Wedding 2 earned $1.02 million from last night's first shows. That's a solid start for the rom-com sequel as it aims to counter-program the male-heavy superhero blockbuster pic this weekend. Weekend estimates and official Friday estimates from the studios will be reported here on Saturday morning. Stay tuned. Friday Afternoon Update: Captain America: Civil War (aka Captain America 3) led all upcoming films for the second time in the last three weeks with 65,000 on the week. If that seems low its because it is, the lowest leading total for weekly tweets since the week ending January 2nd of 2015 when Focus led all films with 62,401 tweets. Much of the buzz this past week was centered around Batman vs. Superman which had over 1 million tweets, giving it the second largest pre-release buzz of any film on Twitter behind The Force Returns. However, since I don't include films in their opening week for this metric it isn't included in the numbers below. 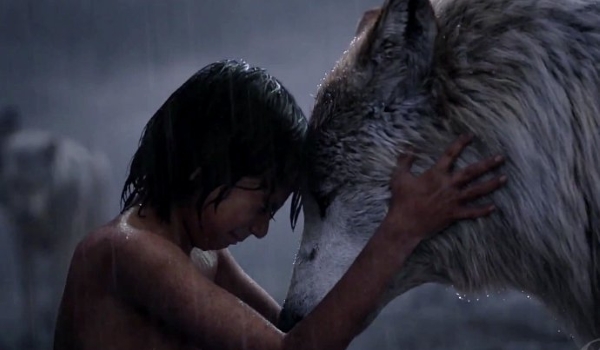 The Jungle Book jumped up to 2nd spot on the week as its marketing kicked it up a notch with its release now three weeks away. These levels of buzz for a live action family film is actually quite strong, by comparison Pan had just under 4,000 tweets the same distance before release last year. Things are looking promising for the remake at this point. After basically having zero buzz over the past few month Bridget Jones' Baby debuted its trailer this past week which saw it peak at 18,319 tweets on Wednesday. Shows that there is yet some life in the franchise as the first trailer for My Big Fat Greek Wedding 2 had just 13,634 tweets back in November of last year. The other big notable on the past week was Deepwater Horizon which cracked the top 10 for the first time with the help of its first trailer that nabbed 9,860 tweets on Wednesday. Seemingly somewhat of a soft debut, especially for a Mark Wahlberg headliner film but when we look back at Lone Survivor which featured the same director it had just a shade over 3,500 tweets for its first trailer. Wahlberg, as always, seems to have another hit waiting in the wings. Please check the methodology page for information about our Twitter project or here for historic data. Disney's Zootopia took in $4.49 million on Thursday to remain in first place at the daily box office. The blockbuster 3D computer animated film from Walt Disney Animation Studios was up a strong 25 percent over Wednesday and down just 1 percent from last Thursday. Grosses in general yesterday were helped out by those off for Holy Thursday. Zootopia was the week's top film with a weekly take of $53.64 million. That was down just 25 percent from the previous frame and brings the film's three-week total to a very impressive $217.41 million. The Divergent Series: Allegiant held steady in second place with $1.90 million. The third installment of Lionsgate's young adult franchise starring Shailene Woodley was up 14 percent over Wednesday. 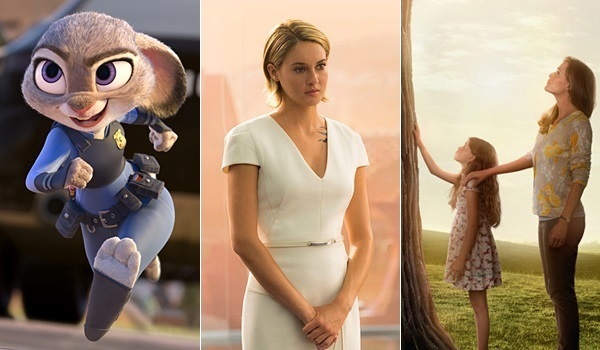 Allegiant placed in second for the week with a softer than expected seven-day start of $37.11 million. The film is currently running a very underwhelming 42 percent below the $64.32 million seven-day start of last year's The Divergent Series: Insurgent. Sony's Miracles from Heaven grossed an estimated $1.60 million to remain in third. The modestly budgeted faith-based film starring Jennifer Garner was up a healthy 22 percent over Wednesday and down only 4 percent from last Thursday. Miracles from Heaven took third place for the week with $21.07 million and has grossed $24.63 million in nine days. The film is running in line with expectations and is performing nicely with its modest price tag in mind. Paramount's 10 Cloverfield Lane followed in fourth place with $1.07 million. The J.J. Abrams produced thriller declined 1 percent from Wednesday and 28 percent from last Thursday. 10 Cloverfield Lane passed the $50 million mark yesterday and has grossed $50.01 million in two weeks. The film took fourth place for the week with $17.33 million, which represented a 47 percent decline from the film's opening week performance. Deadpool rounded out the day's unchanged top five with an estimated $0.825 million. The Ryan Reynolds led blockbuster antihero film from Fox decreased 2 percent from Wednesday and 19 percent from last Thursday. Deadpool finished in fifth this week with $11.53 million. That was down 26 percent from the previous frame and brings the film's six-week total to a massive $344.47 million. Disney reports Zootopia led the way again on Wednesday with another $3.58 million, bringing its 20-day domestic haul to $212.9 million. The critical and commercial smash hit is pacing 46 percent ahead of the studio's Big Hero 6. In second place, The Divergent Series: Allegiant took in $1.67 million yesterday. With a $35.2 million six-day haul, the penultimate franchise film is unfortunately trailing the pace of last year's Insurgent by 43 percent. Miracles from Heaven tallied $1.32 million on Wednesday, giving it an eight-day haul of $23.0 million. The latest faith-based success from Sony is enjoying positive word of mouth as it heads into what should be a strong Good Friday and Easter weekend. Paramount and Bad Robot's 10 Cloverfield Lane took in $1.08 million in fourth place yesterday. With a strong 13-day cume of $48.9 million, the thriller is pacing 66 percent ahead of 2012's The Cabin in the Woods. Meanwhile, Deadpool rounded out the top five with another $0.84 million yesterday. The blockbuster's domestic total now stands at an impressive $343.65 million.